It’s with great excitement that we can announce that descriptions of The Portrait of a Living Archive photographs are now appearing in Library Search. This collection of photographs is particularly poignant to us here as they portray people whose work is held on our shelves, but more importantly these are photographs taken by our own photographers, Jamie and Gwen. 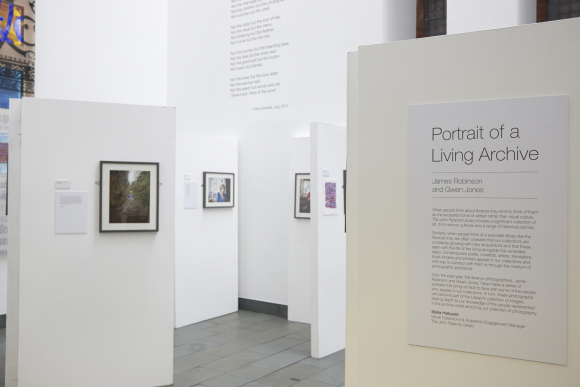 Jamie Robinson & Gwen Riley Jones, two of our photographers from the Imaging Department, made a series of photographs for an exhibition held here in 2013 that bring us face to face with some of the people who appear in our collections. And now, these photographs have become part of the Rylands collection of photographic art, adding a depth to our knowledge of the people represented on our shelves. This collection of 13 images also expands our rich holding of photographic portraiture, as previously discussed by Curator Anne Anderton, by bringing it right up to date with current techniques, processes and people. When people think about a library they tend to see it as a home for written rather than visual culture, so this collection of portraits could be seen as something of an anomaly for a library setting. However, since 2012 when we began curating and managing a designated Visual Collection, the Library has been invested in bringing our visual culture to the fore and using it in creative and imaginative ways to enhance our student learning and to find different ways of engaging with our public audiences. We’re keen to join in conversations looking at the impact of visual literacy, and we hope that the promotion of our photographic, fine art and object collections will have a resonance with our audiences. For a specialist library like the Rylands people are often unaware that our collections are constantly growing as we acquire new items from contemporary writers, poets and novelists, translators, bookbinders and printers. The exhibition, POALA, explored the connection between our archives and these ‘living’ writers and artists through portraiture. Each participant was asked to be photographed in a location that was significant or meaningful for them. 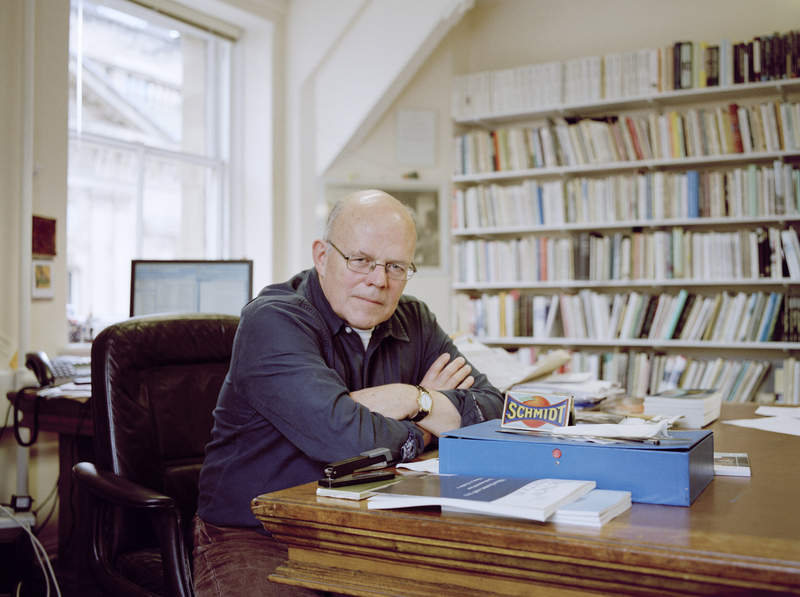 Michael Schmidt, the poet, novelist, critic and Managing Director of Carcanet Press, is seen in his office, sat at his desk, surrounded by shelves full of books with his computer partially hidden behind him. It’s easy to imagine him there creating some of the work and archival material boxed on our shelves. 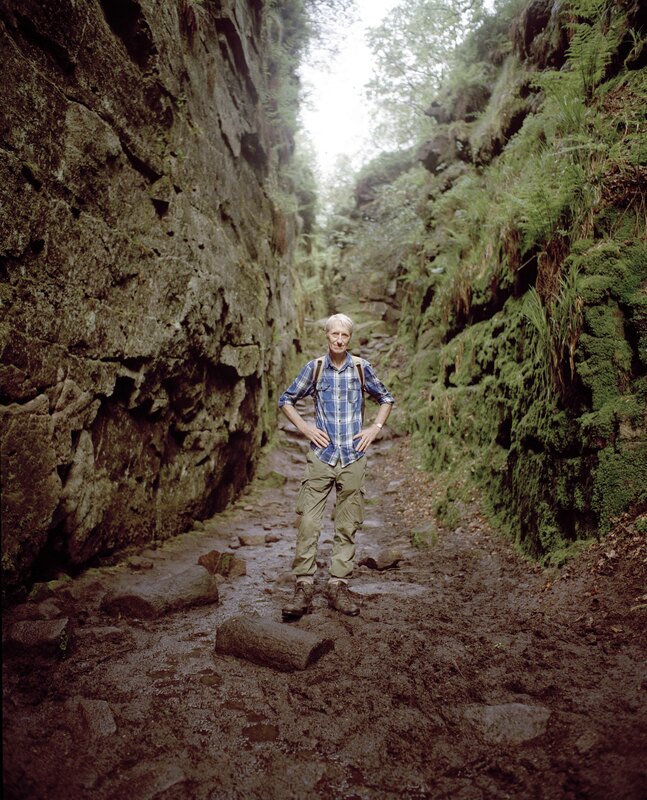 Similarly, the poet Grevel Lindop was photographed at Lud’s Church, Derbyshire, a very different environment and atmosphere to the previous image, but it is easy to picture him pondering on the landscape and taking inspiration from such a setting; and again those thoughts are captured in volumes and in archive format on the Rylands’ shelves. Grevel Lindop gives his thoughts on being in the archive at Rylands in his blog here. It’s interesting to reflect on the impact the photographs made on the visitors to the exhibition. Would they have recognised the commonality between the photographs, for example those writers who chose to be photographed against a backdrop of heavily laden bookshelves or the artists, printers and bookbinders, photographed with the tools of their artistic practice? These photographs add another dimension to our understanding of the creative process, where the writers work and their places of inspiration, and in their simplest form they add a face to a name. Cataloguing these images has proved a little bit tricky. We’re in the fortunate position of having Jamie and Gwen on site to ask questions of and clearly we have lots of background information about context, the hows and whys behind the exhibition too, but where to add it? Yes, it makes a full cataloguing record, but would we normally add all that extra detail, is it consistent with how our other photographs are catalogued and will it be relevant to those who want to engage with the image? Hopefully, we’ve managed to include all the pertinent information, but you can always get in contact with us if you wish to know more. In previous blogs about the Rylands photographic collections there has been a lot of focus on architectural photographs and landscapes; due in part to the strength of our collection in this area and also more generally because of the popularity of these subjects in early photography. In fact, the earliest known example of a permanent photograph is View from the Window at Le Gras by Nicéphore Niépce, and it was also the first architectural photograph as it was a view of buildings. However this final blog on the material we have catalogued as part of our Paul Mellon funded ‘Out of the Ether’ project will detail some of our beautiful photographic portraiture. Our portraits range through prints on paper and card to cased photographs and photo jewellery. Like the architectural and landscape examples, we have good representation in the portraits of the early photographic techniques. What is perhaps different is that as well as being interesting from a technical or aesthetic perspective, very often portraiture elicits a further emotional connection to the piece. A daguerreotype portrait of Catherine Hannah Dunkerley set in a case. The images above and below are two of our cased photographs. Above is an example of a daguerreotype and the lower image an ambrotype. A daguerreotype is one of the earliest photographic processes, named after its inventor Louis Daguerre and the format was predominant in the 1840s-1860s. The support for the image is silver plated copper, which is housed under glass. The result is an image that when viewed can appear in the negative or as a positive due to the reflective, mirrored surface. This makes them fairly easy to distinguish as a format. Due to the expensive nature of the materials the daguerreotype was a relatively luxury item, so the sitters for such portraits would likely have a degree of wealth or social status. The second is an ambrotype, rising in popularity through the 1860s and beyond. Ambrotypes are photographs on glass plates, produced through wet plate collodian process and made into a positive image by mounting them on a black background. These were very popular as they were less expensive than the daguerreotype and therefore more accessible. A hand tinted 1/6 plate ambrotype photographic portrait of an unknown woman and child. The lady in the ambrotype above is wearing all black clothing, including gloves and bonnet. The attire suggests mourning dress which was quite a formal process in the Victorian era. Children were not subject to the same rules so the little girl sitting on her lap would not have been required to wear the same colour. Mourning and loss was something that definitely influenced the popularity of photo jewellery. The concept of Memento Mori jewellery (‘remember that you have to die’) was not new, but in the Victorian period developed into a complex visual symbolism that was often incorporated into the jewellery. The two items below are examples that are likely mourning pieces. Photographic brooch, containing a daguerreotype portrait of a young man. The first is a brooch containing a daguerreotype portrait of a young man; however the indicator that it may be a mourning piece is the back, which bears an example of ‘hairwork’, often utilised in mourning jewellery. In this piece, hair (presumably the young mans) has been woven into a beautiful geometric pattern and encased on the reverse of the brooch under glass. The second is an ambrotype of a very young girl holding a ball. On the reverse is sadly revealed a memorial scene that indicates the death of the child. The urn symbolises death, with the broken or severed tree symbolising that it was unexpected or early. An ambrotype portrait of a very young girl. The last image I would like to highlight is perhaps my favourite. It is a tondo, (circular) albumen print, by Julia Margaret Cameron. The children in the image are Julia Margaret Cameron’s grandchildren, Margaret and Adeline Norman. A decidedly sombre portrait, the two girls are seated with their heads close together; Margaret (on the left) has her gaze directed towards the floor and Adeline looks off into the distance with her head tipped towards her sister and her arm around Margaret’s shoulder. This photograph was made shortly after the death of Julia Margaret Cameron’s only daughter, Julia Norman, in childbirth. Particularly poignant is that Julia and her husband Charles Norman had been the ones to gift Cameron with a camera, as Cameron herself had described in her own words: ‘My first lens was given to me by my cherished departed daughter and her husband, with the words, “It may amuse you Mother, to try to photograph.”’. It is signed by Cameron, ‘From Life’. Portrait of Julia Margaret Cameron’s grandchildren, Margaret and Adeline Norman. As well as being available as records in the University of Manchester Library Search, all these examples are fully digitised and available to view in the Manchester Digital Collections. This is my final blog from within the Visual Collections team, as the ‘Out of the Ether’ project is now at a close; but I would like to express my thanks to both Clare Baker and Stella Halkyard in the Visual Collections department for making my stay a very happy one. The collections will continue to be catalogued and much more exciting material will continue to be made accessible through the work in the department. All images unless otherwise stated are copyright of the University of Manchester and can be used under the Creative Commons Attribution-Non Commercial-Share Alike Licence. With thanks to the Heritage Imaging team. A Mystery Methodist: Is this John Wesley, Charles Wesley or someone completely different? One of the fascinating aspects of working with special collections is the opportunity to uncover treasures that have previously lain undetected and unidentified. One recent find from our world-leading Methodist collection is what appears to be an early 18th century oil painting of a young man wearing preaching bands – the forerunner of the modern clerical dog-collar (image 1). Written on the back of the portrait is the identification “John Wesley 1726” (image 2). This handwriting is probably late 19th or early 20th century in date – more recent than the painting itself. There is no provenance (record of ownership or custodianship) with the portrait and no indication of how or when the item entered the collection. If authentic, this portrait would be of great interest as a previously unknown likeness of the founder of Methodism. It would have particular value as a depiction of Wesley as a young obscure Oxford academic before his meteoric rise to fame as one of the greatest leaders of the post-Reformation Church. Accurate identification of portrait subjects is often fraught with difficulty even for experts and this particular example is no different. Many likenesses exist of John Wesley. Over the last 250 years, his face has appeared in formal portraits, street sketches, caricatures, on commemorative tea pots and Christmas calendars. However, comparatively few of these were taken from life and what Wesley really looked like remains an open question, particularly as his appearance changed over the course of an 87 year life span. 3. Engraving of John Wesley by John Faber, c.1741. 4. Another 18th-century copy of the engraving by Faber. The confirmed likeness of the adult Wesley that is the closest in date to the 1726 portrait is an engraving by John Faber of an original painting by John Williams dated circa 1741 when Wesley was aged 38 (image 3). There appears to be a superficial facial resemblance between the subjects depicted in the two works, but there are also significant differences, which cannot all be accounted for by the interval of approximately 15 years between the sittings. Most noticeably, there is a dimple in Wesley’s chin in the Faber engraving, which is not there in the 1726 portrait. The 1726 sitter also has a high forehead and thinning hair compared with the later likeness. Facial comparison is a very uncertain way of identifying a portrait and is inevitably subjective. This is rendered even more complex when one is reliant on engravings produced by printers of varying quality. This problem is illustrated by image 4, which is another 18th copy of Faber, but one that is noticeably different in appearance from the likeness in image 3 even though it is taken from the same source portrait and engraving. To further complicate matters, image 4 is misidentified as Charles Wesley. All of this testifies to the difficulties in making accurate identifications even from contemporary or near-contemporary evidence. If one assumes that the 1726 painting is not a portrait of John Wesley, the founder of Methodism, then could it be a different John Wesley? The fact that the sitter wears clerical bands indicates that he was in Anglican orders and was probably therefore educated at either Oxford or Cambridge. No-one by the name of John Wesley matriculated at Cambridge during the first half of the 18th century, but four John Wesleys or Westleys entered Oxford during this time-frame. However, with the exception of the founder of Methodism, none of them are recorded as having subsequently entered Holy Orders. Portrait of Charles Wesley, unknown artist, c.1735. Another less likely, but nonetheless intriguing possibility, is that the 1726 subject was not John Wesley, but his younger brother Charles (1707-88). Charles entered Christ Church Oxford in 1726 at the age of 19 with a prestigious King’s Scholarship from Westminster School and a portrait might have been considered appropriate to mark the occasion. Charles was not an ordained minister in 1726, but his formal dress as a King’s Scholar comprised a robe and bands. Again, there are some intriguing facial similarities between the 1726 sitter and the earliest generally accepted adult portrait of Charles Wesley by an unknown artist, dated circa 1735 (image 5). Ultimately, identification of this early portrait with Wesley rests principally on the name and date written on the back. It is possible that whoever recorded that information was wrong and that there is no connection. However, it is also possible that the subject of the portrait is correctly recorded as “John Wesley 1726”. The question should be asked why would the anonymous owner/custodian have made such a positive and precisely dated identification without specific reason? In support of this possibility is the fact that the painting is a crude piece of work. It has been described by Dr Peter Forsaith, an expert on Wesley portraiture, as “extremely primitive, in composition and technique – an itinerant rural artist at best.” This is perhaps the kind of portrait that John Wesley, as a poor scholar, would have been able to afford to mark his election in 1726 as a Fellow of Lincoln College, Oxford. Perhaps the artist was not talented enough to add Wesley’s dimple or paid enough to do full justice to Wesley’s flowing locks – always a source of great personal pride to the Methodist patriarch. Such niceties of depiction lay in the future when Wesley was painted by eminent society artists and knew his own “best side”. In conclusion, the best that can be said is that this portrait is supposedly of John Wesley in 1726. It certainly belongs in the category of many ‘unauthenticated likenesses’ of the Methodist leader, but it raises enough doubt and possibility to allow for a lively and fascinating debate. On the 150th anniversary of the death of Elizabeth Gaskell (on 12 November 1865), a mystery surrounding the true identity of a silhouette suspected to be of the Victorian novelist has finally been solved. Silhouette portrait of Elizabeth Gaskell, c.1830s. A team from The University of Manchester used state of the art facial measuring software and more traditional provenance research to authenticate the silhouette, which is owned by the descendants of the Gaskell family. 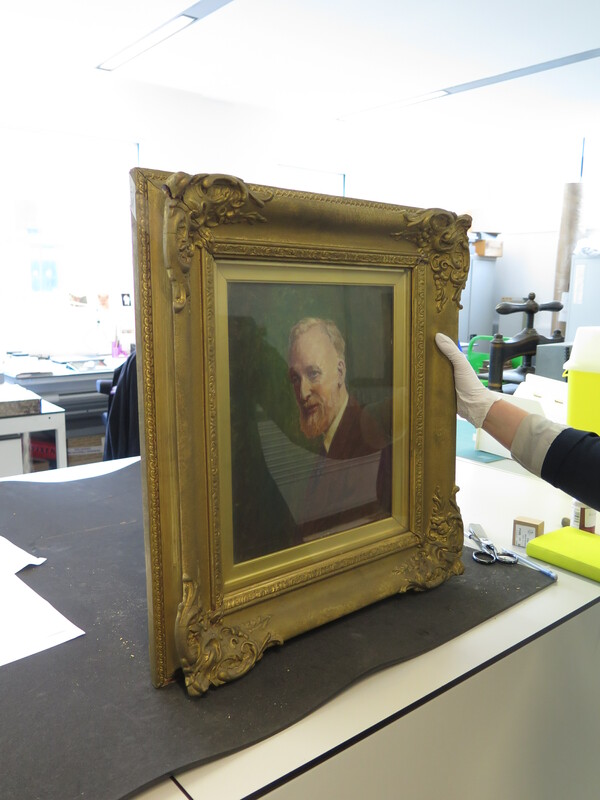 Following their research, medical artist Ray Evans and Stella Halkyard, the Library’s Visual Collections Manager, have concluded that, while they can never confirm the silhouette’s authenticity irrefutably, it is very likely to be of Gaskell. Portrait miniature of Elizabeth Gaskell [née Stevenson] by W. J. Thomson, [June 1832?]. Both images are now available via the world’s largest online collection of Elizabeth Gaskell’s manuscripts and printed works. 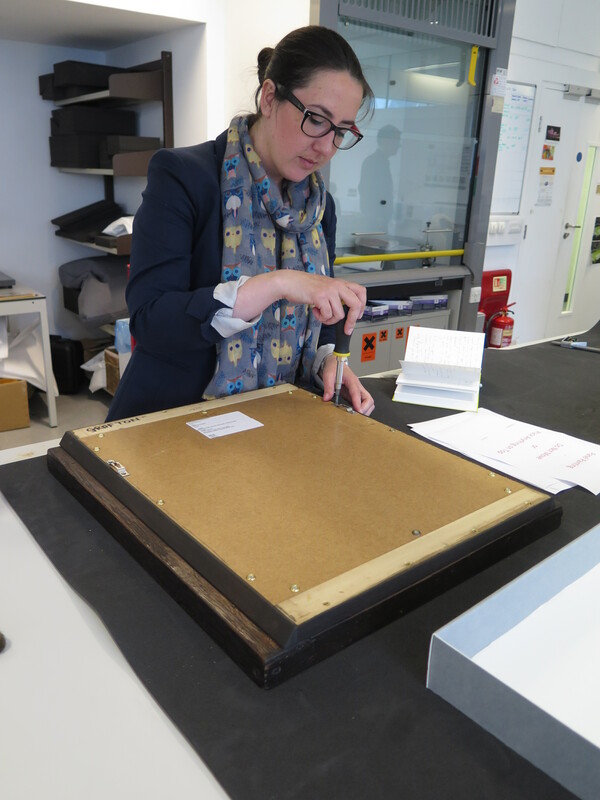 Freelance paintings conservator Elizabeth Jowett has recently been working on a small number of our paintings at the John Rylands Library. Elizabeth has carried out preservation work to four paintings from the visual collection. This work has enabled the paintings to be hung in the library’s purpose built storage area. 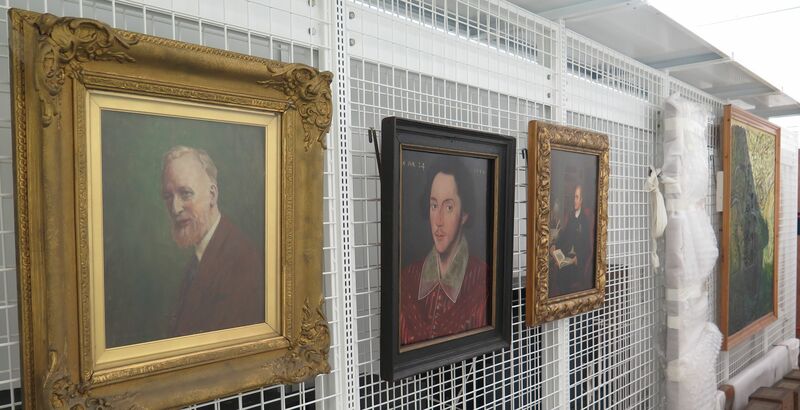 Two of the paintings are portraits of important figures in the history of the John Rylands library, Earl Spencer and Walter Llewellyn Bullock. The portrait of George John Spencer, 2nd Earl Spencer (1758-1834), is painted in oil on panel. It was painted by Jacob Thompson (1806-1879). In 1892 Mrs Rylands acquired Earl Spencer’s collection from the Althorp Library. This is one of our foundation collections and includes the Aldine Collection. Ryman fittings were attached to the painting to allow it to be hung in store. The fittings can also be used to hang the painting during exhibitions. The portrait of Walter Llewellyn Bullock is oil on canvas. Walter Llewellyn Bullock (1890-1944), Serena Professor of Italian from 1935 to 1944, gifted the Victoria University of Manchester his collection of early printed books, many of which he brought into his classes when teaching undergraduate courses. Brass fittings have been attached to the frame of the portrait to ensure the canvas and the backboard are held securely in place. This was necessary in order for the painting to be hung safely. The Grafton Portrait was also moved from the historic building to the storage area in the 2007 part of the Library. The Grafton Portrait dates from 1588; it is by an unknown artist and is painted in oil on an English oak panel. Panel paintings are susceptible to damage caused by fluctuations in temperature and relative humidity. 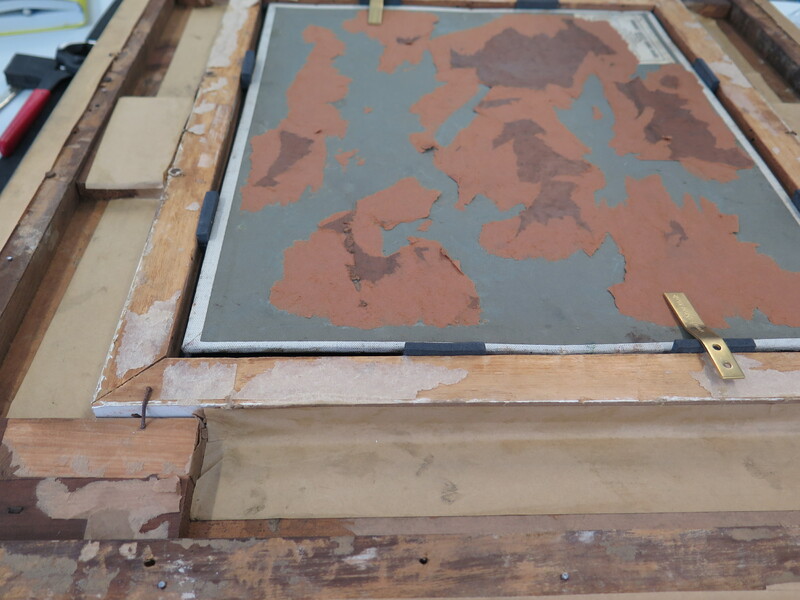 In order to minimise the risk of damage to the panel during the move, the painting was removed from its frame, allowed to acclimatise to the conditions in the storage area, and then returned to its frame. Paintings in the storage area. The final painting is a large abstract work by Jeff Nuttall. Nuttall (1933–2004) has been described as an artist, poet, jazz musician, social commentator, theatrical innovator and influential art teacher – he was a pivotal figure in the ’60s counter-culture in Britain. A considerable amount of dust and loose debris had accumulated on the back of the canvas. This was removed using a brush and vacuum and hanging fittings were attached to the frame.